Every year it seems there is a movie that comes along that doesn't get its due at the time, but people discover later only to wonder, "How is it that I didn't know about this totally awesome movie?" I get the sense that Hotel Artemis may well be that movie for 2018. This is undoubtedly the coolest movie of the year and you're going to want to see it as soon as you possibly can. Be one of the cool kids and see it sooner rather than later so you can stand proudly upon your ivory tower made of cool and absorb what this movie has to offer, which is a whole lot of violence, intrigue and people who are nothing if not fun to watch. Hotel Artemis picks up on a Wednesday night in the year 2028, and the streets of downtown Los Angeles are impassable. The most violent riot in L.A. history has broken out over demand for clean water. The city's privatized police force is at war with the citizens of the city who are demanding clean water. Amidst all of this chaos, four men find themselves in the middle of a failed bank heist that goes extra sour and finds one of their men in desperate need of medical care. Sherman Atkins leads his injured brother Lev Atkins and another member of their crew to a mysterious hotel in order to seek the help of a nurse who fixes up criminals. There, they intersect with several other seedy characters whose paths are about to become entangled, whether they like it or not. Drew Pearce, known for his work as a writer on movies like Mission: Impossible - Rogue Nation and the upcoming Sherlock Holmes 3, makes one hell of a feature directorial debut here. There are certainly some Tarantino vibes at play, but Pearce is no mere imitator. Like many great directors, he is borrowing from a great many things in order to make this movie his own. A dash of John Wick and The Continental hotel here, some Guy Ritchie and Shane Black there. While there are some parallels to be drawn here in terms of influence, Hotel Artemis serves as something totally refreshing and unique in the summer movie landscape this year. It's a brutal, often hilarious, sharp, streamlined and all together entertaining movie that is very brisk but feels complete. Pearce wastes no time and is very exacting with what he puts on screen. Unquestionably, the best asset this movie has is its cast. Hotel Artemis is a straight-up murderer's row of talented individuals that we love to watch on screen. Jodie Foster gets the best role she's had in years as the hotel's loyal nurse. Remind me again why she's not in movies all the time? Sterling K. Brown also gets a very meaty role here and continues to assert himself as one of the most diverse and compelling actors working today. Jeff Goldblum chews up the screen whenever he's on it and brings every ounce of charisma to this flick one might expect. The fleshed out ensemble, which also includes the likes of Sofia Boutella, Charlie Day, Dave Bautista, Zachary Quinto, Jenny Slate and Brian Tyree Henry are used perfectly here as well. This is a true ensemble piece in the best sense. It's an embarrassment of riches. This movie is clever, fast-paced, fun and truly distinctive. It's very well thought out and doesn't demand much from the viewer beyond strapping in for a good time. Unless you're firmly against R-rated action movies, it's tough to think of any reason one wouldn't enjoy this. 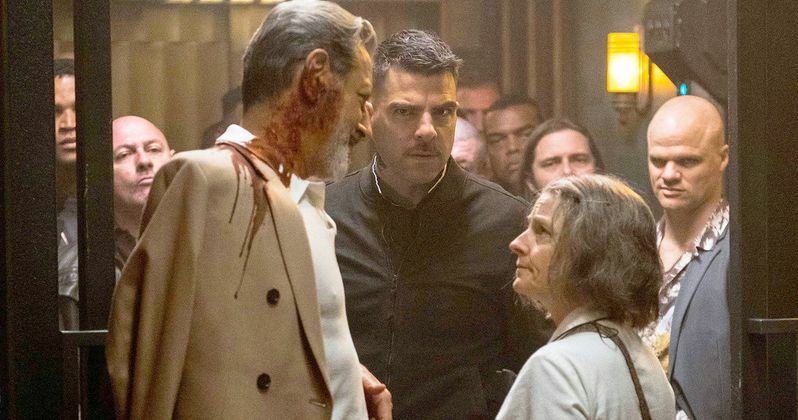 If you're looking for a break from superheroes, sequels and the usual offerings the summer season brings with it, but still want some good action and laughs for your money, Global Road Entertainment has you covered with Hotel Artemis.